By the mid-1830s, Chopin was enjoying success with the publication of his music and had also been widely praised as a performer. These four mazurkas are among his better efforts from that period, and at least the first of them, in G minor, is one of his more popular, not least because of its relative ease of execution and melodic appeal. The four cover a wide range of moods and keyboard colors, their variety supposedly prompting the composer to play them differently every time he performed them. A performance of the group lasts perhaps 12 or 13 minutes. 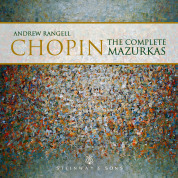 That first mazurka, marked Lento, begins with a wistful theme, a typical Chopin creation in its elegance and overtones of sadness and longing. The middle section is brighter and more colorful, but does not quite dispel the overall dark feelings. The main theme returns to reinforce the reflective mood from the opening. The second mazurka, in C major, is bright and joyous. Marked Allegro non troppo, it achieves an effective contrast with the preceding item and evokes the mazurka's folk-dance ancestry in its rhythmic vitality and playfulness. The main theme is sprightly and full of life, with the middle section of the same character but divulging a more muscular sound. Some Chopin scholars have heard a certain measure of restlessness or discontent in this piece, focusing on the mixture of church modes and other tonalities in the work, and consequently interpreting them to reflect indecision and uncertainty. In the end, this must be assessed as a fine, light work of bright colors. The third mazurka in this collection, the A flat major. is marked Moderato, con anima; its main theme is vaguely reminiscent of that of the G minor mazurka, though the mood here is brighter. Once again, Chopin demonstrates that even when he is generally upbeat, he often cannot resist suggesting a vague longing or feelings of regret. Still, the music is mostly cheerful and elegant throughout. The composer offers an attractive coda to close the piece. The last mazurka from Op. 24, in B minor, is the longest, at about five to six minutes, and perhaps the gem of the set. It presents a range of feelings and colors, yet every page is characteristic of the composer in its charm and grace. "Charm," in fact, is the catchall term that best describes this piece. The main theme is fiery, moving from elegance to passion, from appeal to seduction, never seeming to attain the climactic release it seems to augur. The middle section is subdued by comparison but ironically builds to a climax for the reappearance of the main theme. After a return of the opening materials, the piece fades slowly to silence.